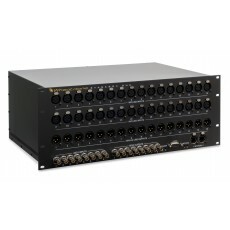 The 4RU StageBox One extends console I/O, providing 32 mic/line inputs, 16 analogue line outputs, and 8 AES3 inputs and 8 AES3 outputs as well as 12 logic ports and dual Ethernet ports. Its heavy duty construction makes it adept for on-the-go applications, such as remote sporting events. StageBox One works with all WheatNet-IP audio networked consoles.